guitar, cigar box guitar, bass, banjo, ukulele, guitalele, merlin, or mandolin? which to choose? tags: "The Office", banjo, bass guitar, beginning musicians, cigar box guitar, guitalele, guitar, mandolin, music, seagull merlin, sound and video samples, ukulele, what instrument to play? This is a brief introduction to several instruments. It is a post for those who have never tried a stringed instrument before, and are now trying to decide what to play. This post is also for those who have tried a stringed instrument, and feel like it might not be the right one for them. I have tried all of these instruments. I have not played any stringed instruments with a bow, except for squeaking maddeningly for a few minutes on my friend’s violin, so I will not be writing about violins, cellos, etc. I will briefly describe the instruments, and some positive attributes and disadvantages of each instrument which you might consider trying. Also, I’ve included at least one video of each instrument being played well. I do not make any money endorsing any products. Everyone has their favorites, and I have mine. One other thing before you read any further.. You might be tempted to buy an instrument online. I recommend avoid doing this if possible. Best to go to a store, and get the feel of an instrument. Even if you buy the same model of guitar or whatever online, it won’t be the exact same instrument, and will therefore feel differently. Oh yes, and be extremely careful about buying from people on craigslist, for two reasons.. 1. do you really want to walk into the house of a stranger? Better to meet in a public place if you can. 2. Don’t buy an instrument unless you have a friend or relative with you who already knows about the instrument you are interested in, and can spot a bad one. The first part of the post I am writing as much as a note to myself as I am for others, but since there might be a few of you who are simultaneously (dammit I can never spell that word right – instead of trying four times, just googled it instead) ok then.. simultaneously insanely passionate about music AND suffering from severe attention deficit disorder (or in my case attention deficit hyper-activity disorder-combined type, so I was told) you might feel a strong desire to start learning more than one of these instruments at once. Yes, there are tons of multi-instrumentalists out there, and I know some, but I’m guessing they started on ONE instrument, became proficient at it, and THEN began work on learning another instrument. Think about wanting to learn both Spanish and Japanese. Wouldn’t it be better to pick one than to start on both? Yes, ok, it is a good idea to at least dabble a bit with several instruments, just as it is a good idea to check out language materials for both languages from your local library. But then, make a decision. And stick with it for at least a little while. Give yourself some time. If you are having trouble picking a stringed instrument, spend some time in a music store, or over at a friend’s or relative’s house if that person has more than one instrument, etc. Try different instruments, and different models of the same instrument before you buy. And if you find yourself in a music store with unfriendly staff who don’t seem to want you to try out instruments, go to another music store if you have that option, or just don’t mind the staff. String spacing. The space between strings on all these instruments is quite different from all the others. Even on a ukulele, there is more space in between the strings than there is on a guitar. Number of strings: Guitar – 6. Mandolins have 8 strings, but they are played like instruments with 4 strings – just as 12 string guitars are played like 6 string guitars. Ukuleles and basses have four strings. A guitalele (also called “guilelele,” depending on the brand) is, as you no doubt guessed, a cross between a uke and a guitar. It looks like a miniature guitar, and has 6 strings, but it is not tuned the same way as a guitar, and its four highest pitched strings are the same notes as on the ukulele, except that the G string is an octave lower than on the uke, If you don’t know what that means, that’s ok.
Actually.. I will explain octave – “oct-” meaning 8. Look at a piano keyboard, and put your finger on one of the white keys. Count to the left or the right 8 places.. just the white keys. Let’s say you start on a key that is a C note, and start moving toward the right – higher in pitch.. C-D-E-F-G-A-B-C. The 8th key is also a C, just an octave higher in pitch. The Seagull Merlin (I have a separate post on this one, but I’ll reintroduce it in this post too), is an instrument based on a mountain dulcimer, but can be played like a guitar. It has 4 strings, but two are very close together, so it is played like a 3 stringed instrument. Cigar box guitars usually have 3 or 4 strings. Tuning – The instruments are tuned differently! Only two exceptions – the notes on the 4 string bass guitar are the same as the four lowest notes on the guitar, just in a lower octave. The other exception – the guitalele which I already described. Actually, there is one more exception, if I remember correctly. The baritone ukulele is not tuned like the other size ukes – the soprano, concert, and tenor ukes are all tuned the same, usually, but the bari uke is not. That one has notes that.. I think are the 4 highest pitched notes on a guitar. If you are interested in ukulele, don’t start out on a baritone. You’ll have serious trouble finding any educational material relating to that instrument – except for maybe a few youtube videos. Here’s an example of how a differently tuned instrument can throw you off.. If you switch from guitar to guitalele, the chord shapes (finger positions) will be the same, but the chords will be different. The guitar is tuned in E, and the guitalele is tuned in A. (These letters refer to musical keys. Each key has a certain set of notes that make up each key. Almost all the instruments, regardless of what key they are tuned in, can play music in all keys. The merlin and cigar box guitar are the exceptions). You can play the same song with the same finger positions on both guitar and guitalele, however, the guitalele will sound like a guitar with a capo (a clamp put on the fretboard of a guitar to change the guitar tuning/key) placed at the 5th fret of the guitar. It’s best to get used to one tuning. If you are going to pick two instruments to start at once (which you shouldn’t), then start on guitar and bass, since four of the same notes are found on both. I’ll have a little section on each instrument in a moment, but first..
Cigar Box Guitar – usually tuned in open G.. 3 string: GDG, open D: DAD.. But there are some variations. You can likely tune your CBG either way. I bought mine in open G tuning. If you are unsure whether yours can be tuned differently, send in a question to your vendor. Lots of sellers of these instruments on ebay. Uke – key of C: gCEA. The “g” is little because it is higher in pitch than the C or E. This makes playing awkward, especially at first, for those of us who have already learned how to play guitar, bass, mandolin or violin. Banjo players, however are used to this odd style of tuning, called re-entrant tuning. Mandolin tuning: (two strings for each note) GDAE – like on a violin. Seagull Merlin – two models: Open D – DADD, Open G: GDGG. You cannot alter the tuning on your Merlin from D to G. You’ll break the strings. You’ll have to buy replacement strings in a different key, instead of trying to re-tune your Merlin. Some Merlin enthusiasts own one in D and one in G, so they don’t have to change the strings on one instrument. Merlins are not expensive, so for serious Merlin players, this is a practical choice. Ok then.. a bit of info on the various instruments, and some great videos of each. Banjos tend to have 5 strings, though you can get 4 string uke-banjos or 6 string banjo-guitars. But if you want to start playing banjo, get a standard 5 string banjo. You might find the banjo a bit awkward, especially at first, to play and hold. I have found it to be the most awkward of all – but you’ll get used to it. A bit tough compared to the guitar to play while sitting down, but again, with practice, no problem. Unlike guitar, bass, and mandolin, the 5th string (the string closest to your head, when the instrument is held horizontally, unless you are left-handed – the string closest to the floor is the 1st string) is not the lowest pitched string. This can make playing single note lines more challenging then on the instruments I just mentioned. The ukulele shares this peculiarity called re-entrant tuning. Grrr. You’ll likely be wearing plastic picks on thumb and fingers – but you’ll get used to these. Guitar teachers are everywhere – even if you live in a small town. Good luck finding a banjo teacher. Plenty of videos on youtube though. Not all that many music stores sell banjos, and those that do will likely have few to choose from. A good beginner banjo might cost at least $300. I don’t know enough about banjos to give a solid recommendation on a variety of brands, but I did play an Ibanez banjo this past week that felt and sounded surprisingly good. I don’t remember what model it was. Price was close to $300, I think. Best thing about the banjo is it is tuned in such a way that when you play it without pressing down any strings, it already makes a chord. You can just slide one finger down the neck, barring all the strings, and there you go – lots of good sounding chords (called major chords) with just one finger. This is called “open” tuning. You can’t do that with mandolin, guitar (in standard tuning), bass, or uke. Merlins and cigar box guitars also have open tuning. Disadvantages of banjo, besides those I already mentioned – if you want to be in a rock band, and play your favorite hits – unless you and your buddies want to get creative, you might have difficulty finding other people to jam with, since banjo is usually associated with bluegrass, americana and country music. Here’s one of the best banjo pickers. He’s actually the lead guy in a brilliant, unconventional jazz band, Bela Fleck and the Flecktones. He’s also teamed up with Dave Matthews. Guitar.. so many people have become proficient learning guitar. It is probably by far the most commonly played instrument. I struggled with this instrument for SO MANY YEARS!! Although I know a few hard rock and metal techniques on electric guitar, and can do some cool finger-picking on the classical guitar, I still can’t get through a song very well. I don’t need to write much more about guitar really, except to suggest that if you really want to get serious about guitar, and can put up with some genuine pain for awhile, the best way to learn is to get a good acoustic guitar with steel strings. because steel strings are rougher on your fingers. This means playing them will hurt more than electric guitar strings – also steel but easier on the fingers – or classical guitar strings, which are mostly made of nylon – easier on the fingers. Why would you want more pain? You will strengthen and toughen up your fingers faster. This type of acoustic is the most common. The other type of acoustic guitar is the classical guitar. The neck is wider, the strings are easier to push down, and the sound of the instrument is softer than the steel string guitar. Many teachers of guitar classes in high schools and colleges insist that students use classical guitars in class. This is because some classical music will likely be taught, and because classical guitars are not as loud. I recommend two brands for beginners, because of best quality for the price: Seagull or Yamaha. Ibanez and Fender make decent beginner guitars too. Best to spend at least $200. If you are renting an instrument, as part of a school music program, you might also come across a Takamine or Alvarez. These are likely to be good too. These cheaper instruments will all be foreign-made – most likely in Indonesia, or perhaps China. If you want to buy American, be prepared to spend $500 at the very least, and perhaps a lot more. Some major American acoustic brands are Martin, Taylor, and Gibson. Don’t worry, foreign-made usually doesn’t mean bad. I’ve owned a LOT of instruments, and most of them have been of good quality – and made in Indonesia. If you can tough out playing a steel string acoustic, you will build finger strength, and build up your calluses quickly. But this will be tough, and it will hurt at first. Find a teacher, or learn online if you can’t afford a teacher – but start out with the basics. Don’t try to use tablature (simplified sheet music with lines and numbers) and figure out your favorite songs right away. That’s what I did. This was a dumb move. I didn’t get around to learning the basics until some time had passed. Far better to start out with basic chords and strum patters. Get fancy later. Since there are millions of people who play guitar, I’d say don’t be discouraged by the difficulty, but if you’ve given it a year of serious work and have made almost no progress – time to change up. Don’t be dumb like me. Actually – I get fixated on things – a mental health issue I have.. still dealing with this.. have to keep reminding myself I’m pretty damn hopeless on this instrument, and I should be playing another. Disadvantages.. finger pain, instrument can be a challenge – especially when you are first learning barre chords – chords that you have to use your index finger to “barre” all the strings, and the rest of the fingers for the different chord shapes. This is difficult. Every experienced guitarist remembers the time he or she was working on playing the barre F – the first barre chord taught. Here’s one of my favorite acoustic guitar players, Johnny Butler. He’s from the Boise area, where I also live. I’ve heard him play live three times. He’s still gigging around here on occasion. He mainly plays a steel string acoustic guitar. This dude is awesome, and has a unique, percussive style of playing. I’ve owned both 3 and 4 string cigar box guitars. As you might guess, the number of strings affects the tone. The ones with 4 strings have a fuller sound, but not necessarily a better sound. These are also tuned to an open chord, like the banjo and merlin – you can slide your fingers up and down the strings, or use a glass or metal slide that you wear on your finger (usually ring finger or pinky finger) – all the way down, and get chords all the way. Fewer strings -easier to play than a regular guitar.. mostly. Disadvantages.. less notes available to you – you won’t be able to play all your favorite songs on one of these. Finding a teacher will be really tough. Loads of videos on youtube though. Be careful.. some cigar box guitars are made with the strings so high off the fretboard (where you press on the strings) that you won’t be able to play the instrument using your fingers to fret the strings, you’ll be stuck using a slide only. These guitars are made this way on purpose. There is a guy on ebay who uses the name weeklyhouse. He builds his guitars to have action (string height) low enough to play with either fingers or slide. I don’t know about any other builders. If you are wondering about a cigar box guitar you’ve found online, send in a question. Some independent music stores might even sell cigar box guitars made by local builders – but these stores are rare. You will likely have to buy a CBG online and hope for the best. Both of my weeklhouse CBG’s have been good. He’s built hundreds over the years – maybe even thousands. If you love old-time blues, you will have a LOT of fun with a CBG! Here’s a video of actor Jeff Daniels playing a song on CBG. Good fun! If you decide to buy a cigar box guitar, and want some slides to use, I suggest buying a sampler from Blooze Bottles on ebay. Weeklyhouse guitar auctions start out at $65 (usually) and shipping is around $25. Some builders charge a lot more.. sometimes CBG’s are built with electronics like those found on regular electric guitars.. but you’ll have to pay more for those. Difficulty.. learning to play with a slide can be fun, and is not very difficult, but will require some practice. Playing with fingers – easier than with standard guitar, but you might have some trouble finding resources for fingered guitar chords on CBG. Most people use a slide. A cigar box guitar is easier to learn than a standard guitar, but you’ll be able to play less songs on it. This is because of less strings, less frets, and the way the CBG is tuned. You are somewhat limited also if you are playing with a slide, because you won’t be fretting chords with your fingers – although some people who play slide manage to use a slide and fret some notes with their other fingers. This one is a LOT easier on which to learn the basics than a standard guitar. Why? 1. Only 4 strings on most models (and almost all bass lines are played on 4 string basses). 2. You don’t have to play chords! Just one note at a time! How great is that?! There are basses that have 5 or 6 strings. Almost no bass guitarists use these compared to those who use 4 string basses, and those who do tend to play extremely challenging music, like progressive metal or jazz. Start out on a four string, unless you are very ambitious, and your goal is to play really tough music. If you are wondering if incredibly difficult music, such as jazz, can be played on a 4 string bass, the answer is yes. The late Jaco Pastorius, generally considered to have been the best bass guitarist ever, used a 4 string bass, and usually played astonishingly difficult music called jazz fusion. Another of my favorite jazz bassists, Avishai Cohen, also uses a 4 string bass (when he’s not playing an upright bass), and Victor Wooten, one of the best bassists currently living, sometimes uses a 4 string too. My favorite bass for beginners – actually two models – they feel the same, but sound a bit different from each other: Ibanez GSR 180 (this one does not need a battery put in the back) and Ibanez GSR 200. The 200 model is commonly sold in stores, the 180 is not. The GSR has electronics which require a 9V battery to be put in the back. The 180 usually sells for $179 and the 200 for $199. Some used models of GSR-200, those that were discontinued years ago, do not require a battery, and, in my opinion, sound even better than the newer GSR-200 model that requires a battery. Why a battery? Some bass electronics are more complicated than others, and process electronic signals differently from basses with simpler electronics. It would take awhile to explain this in more detail. The basses without batteries are called “passive” basses because their pickups (electronics) have passive pickups. “Active” basses have pickups that are active – these require a battery. If you do buy an active bass, make sure not to leave the instrument cable plugged into your bass! When the cable is plugged in, regardless of whether the bass is being played or not, the pickups are active, and the power of the battery is running out. Once the battery goes dead, you’ll get no sound from your bass, because there is no longer any electricity powering the active pickups. Personally, I like the sound of passive pickups better, but you might feel differently. If you do get an active bass, don’t turn up the bass equalizer knob all the way up – you will likely cause your amp to make sounds you won’t like, and will eventually damage the amp’s speaker. Besides Ibanez, Squier and Yamaha also make good beginner models, and cost less than $300. Best amp? Go with a Fender Rumble. These come in varying sizes. The cheapest costs about $100, and will suit you well for practicing. Second choice would be Ampeg. Stay away from Guitar Center’s Acoustic brand. I love shopping at GC, but do NOT like their house brand of amps. They rattle. Poorly made. Do NOT crank up the volume on your amp all the way, unless you want to soon buy another amp. Small practice amps are not meant for playing with bands, especially bands that have drummers. You’ll need a much larger and louder amp to play in a band. These amps cost more money. No point in buying a bigger amp if you haven’t yet learned how to play. Disadvantages to learning bass – this is the only instrument on the list which you won’t sound good accompanying yourself while you sing, if you are playing by yourself. You’ll need to be part of a group. Why? Bassists don’t generally play chords. It doesn’t sound good singing at an open mic night, and playing bass, by yourself, because you will be playing one note at a time. Other disadvantages – many people who teach bass are primarily guitar teachers. They’ll likely do an adequate job, so don’t really worry about this.. but if you find someone whose main instrument is bass, that is a plus. Something you will likely notice: limited selection of bass guitars, especially in smaller stores. Another disadvantage.. so many basses are quite heavy. Ibanez models I already mentioned, and some of their others, being an exception. To offset the weight, I recommend a leather, 3″ wide strap. Levy’s is a good brand, but I prefer Franklin straps. Unfortunately, these great leather straps might cost over $40. Worth it. But if you get a light bass, even an average guitar strap might be ok.
And lastly, bassists who do not also sing, are generally ignored by fans. Singers and guitarists attract the most women. Drummers, and especially bassists, are more often ignored, unless they also sing. There are exceptions of course, like Flea, from the Red Hot Chili Peppers, who does not sing, usually, but who is still a rock legend. Another of the most famous rock bassists is Steve Harris, from Iron Maiden. He’s the band’s founder, and writes a lot of their songs. Unlike music by most bands, the bass can very easily be heard on Iron Maiden’s albums. Major advantage! Bass players are always in demand, and many bass players are not all that great. If you can get good at playing bass, tons of musicians will want you to be in their bands. Which is awesome. And here is a much softer song, by one of my favorite bands, Hooverphonic. The bass line is simple, but it drives the song more than most bass lines do. One of my favorite bass lines.. The bass you see in the video is a Longhorn by Danelectro. These basses sound awesome, but are a bit awkward to play, due to their shape, especially while sitting down while pracitcing – I know, I tried one for quite awhile in a music shop – I found it too uncomfortable to play, and didn’t buy it. Also, these aren’t cheap. New ones are selling for $419. But damn, their tone is great. Also, they tend to be quite light, unlike a lot of basses. I’ve just started playing the uke – been at it about two months, but I can already tell you it is definitely easier than learning guitar! But, as I am gradually finding out, not as easy as I first thought. Many of the chords are really really tough, in spite of, or maybe because of the instrument having 4 strings. I’ve been working on chords, and strumming, and have applied some guitar finger-picking patterns to the uke. Yes, the re-entrant tuning, which I mentioned earlier, is a bother when I am playing single notes as opposed to playing chords. This is something I either have to get used to, or I can buy a special set of uke strings, in which the G string is an octave lower than usual. The disadvantage to that is pretty much all learning material – books and online – is for standard uke tuning. I’ll stick with standard tuning, and put up with the G string being higher in pitch than the one next to it. This tuning sounds nice. The uke has a far less full sound than guitar, not exactly great for hard rock and metal playing – although it is possible to play metal on a ukulele. The sound is more high-pitched than a guitar. I have bad tinnitus – ringing in my ears – pretty much all the time I’m awake. Playing the uke bothers my tinnitus just a little sometimes, but the guitar, bass, CBG, and merlin do not. Only four strings – you can’t do everything on a uke that you can on a guitar.. but almost..
You might enjoy this video..I sure did.. A classic metal song played on a ukulele! It is even possible buy electric ukuleles. I don’t just mean acoustic-electric ukes – ukuleles with some electronics built in. No, I mean electric ukuleles that look like electric guitars. There is even one made by Epiphone that is shaped like a Les Paul guitar. 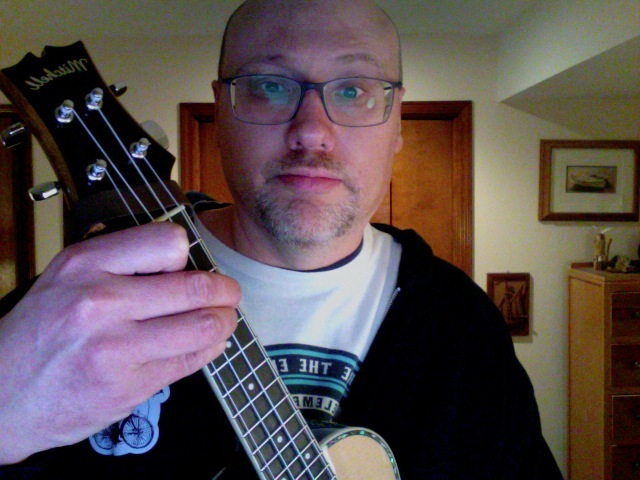 If you want to start out on uke, I suggest avoiding the smallest size, called soprano – like the ones you saw in the video above (as far as I can tell, those are soprano ukes). The next largest size, the concert, is a little easier to learn on – it is a tad bigger, and the spaces in between the frets are a little wider. That one is tricky for me, on my concert uke. I’d probably find the tenor size easier to play, but I like the uke I have, and don’t want to spend any more money on instruments. I previously owned a soprano uke, but the spaces in between frets were too narrow. I sold it to a woman, who has shorter, thinner fingers than I have. Some people really do like a soprano uke though.. try one if you feel like it. Soprano, Concert, and Tenor ukes are all tuned the same. I highly recommend you NOT start out on a baritone ukulele. It is much larger than the others, and also tuned differently from all the others. Tenor ukes, as you might have guessed, are bigger than soprano and concert ukuleles. Here is uke virtuoso Jake Shimabukuro performing on a tenor uke – over 15 million views so far! There are two models made by Mitchell, Guitar Center’s house brand. The one I bought looks more like a guitar than a uke, the other looks less fancy, and like a typical ukulele. Fancy looks aren’t why I bought this one though, I like how it sounds. I haven’t tried the other one. It is a newer model, and was released after I bought mine. But I do like how this one looks. I tried several ukes in the $99 price range. I felt this one was by far the best.. most well-made. I found this one used at a pawn shop for $65. Score!! The tuners on it aren’t the greatest. If you spend more money on a uke (you can even spend thousands of dollars if you want to), you will likely be buying one with better tuners. Here is a video of 9 tenor ukes that are fairly cheap. I’m guessing these manufacturers probably make concert-size ukes too. These instruments will be made in Indonesia, mostly, or perhaps China. If you want one made in Hawaii, be prepared to pay a LOT more money. Don’t worry, Asian-made doesn’t have to mean bad. Almost all instruments I’ve owned – guitars, basses, my uke, have been made in Indonesia, and I’ve not been disappointed with any of these. This next section is for folks in the Boise area.. scroll down a bit if you don’t live around here. I haven’t been to many music stores in the Boise area, but I have visited a few. If you live in the area, and want to head out and try some ukes, you will find a few models at Guitar Center. And the prices will be good. You might find some at Pawn 1 on Maple Grove and Overland. That’s where I bought mine. Usually though, there will be only one or two decent ukuleles for sale there, and the rest will be brightly colored soprano ukes, which look like toys. The Maple Grove Pawn 1 location is the only pawn shop I’ve found that has a section of a store converted into a music shop, and a guy working there who really knows his gear. His name is Chris. He is mostly bald, and of average height. Nice guy. I’ve bought a lot of gear from him. Most pawn shops are not so dedicated to selling musical instruments. You are not as likely to find quality instruments in the other pawn shops, I’m guessing. Not all the instruments at Maple Grove Pawn 1 are of good quality, of course, but many are. Dorsey Music, on north State Street: last time I was there, this store had a very good selection of ukuleles. Two problems with Dorsey Music – higher prices than some stores, and there might still be a creepy sales guy working there – big dude with long permed hair, probably wearing a sleeveless t-shirt and silly-lookig cowboy hat. He likes to go for the hard sale. But hey, if you’ve got the money, and have the patience to deal with a sales person you might not like, then Dorsey is a good place to go. The other people working at Dorsey seemed a bit inattentive at times, but were otherwise nice. These other people I talked with – mostly older folks, dressed classy. But I haven’t been to that store since 2016. Some of the cheapest concert ukes at Dorsey’s were made by a company called Peavey. Peavey has a long history of making amps, PA systems, and instruments. Apart from their Eddy Van Halen signature line of guitars (EVH is selling guitars made by Fender these days though), Peavey instruments, in my experience, have not exactly been great. I didn’t like the Peavey concert ukes at Dorsey’s – too flimsy, wood too thin. I’d say, go for another brand. You’ll find others at that store. Oh yes, I just remembered.. Dorsey’s likely sells Seagull Merlins. I saw two there last time I popped by. Doyle’s Broadway Music: I haven’t been there in many years. I’m guessing mainly used gear is sold there. But there might be some new ukes, and buying a used uke is not necessarily a bad idea. I bought mine used from Pawn 1. You might want to check out that store. There was a woman working at the store when I was there – not friendly at times. However, Doyle is very nice. His shop is on Broadway Ave. Gigs Music on Orchard, just past Emerald – I’ve gone there a lot. Not once found anything I wanted to buy there, but I know other people who love that store and have made purchases there. The main thing I’ve noticed is that the place sometimes has almost no inventory. I’ve never seen ukuleles there. Some of their acoustic and electric guitars have been interesting at least, and occasionally, I’ve seen some cigar box guitars from local builders. But no ukes. If you want work done on an instrument, I hear the proprietor, Andy, is a good tech, and charges less than the techs at Guitar Center. Actually, I don’t know if Andy works on ukes. I’m guessing he does, or can. One unpleasant thing about Gigs – sometimes one or more of the employees will smoke inside the store. I’ve only noticed this a few times though. I have not been to Welch’s Music or Dunkley’s Music, so I can’t comment on those, except that I know those stores are similar to Dorsey’s – not only selling electric guitars, ukes, etc. but also selling pianos and renting band instruments to school kids. All these stores have sales from time to time, so you might get a good price on a uke. Maybe. This is a fun instrument! I’m enjoying it. But yes, it is more of a challenge to learn than I thought. The book I am starting out with is called Ukulele: Complete Edition, by Greg Horne and Shana Aisenberg. It comes with a CD. It covers a lot more than beginner books, but is more expensive – $27. Some beginner books are cheaper. Some books, like the one I bought, include a CD, others, a DVD, or.. just a book. There are probably millions of uke videos on youtube. I’ve not chosen a main youtube uke teacher yet. I recently found an excellent app for learning ukulele, called Ukulele Toolkit. I use mac products. I don’t know if this is available for Android phones and tablets. It is great though – tons of songs to download, recorded, backing tracks that can be customized in several different ways, transposing (putting songs into different keys) scales, chords, and more features. I use it everyday. 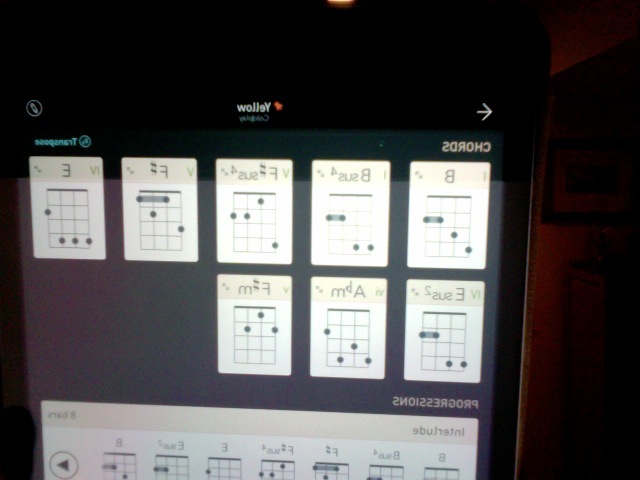 Here’s a picture of one of the functions from the app, showing chords used and then the chord progression. If you look closely at the picture, you will no doubt realize that some of these ukulele chords are.. pretty tough. I had thought mandolin chords were all more difficult, and that there weren’t that many challenging chords on the uke. I was wrong. Keep this in mind if you are trying to decide between mandolin or uke. 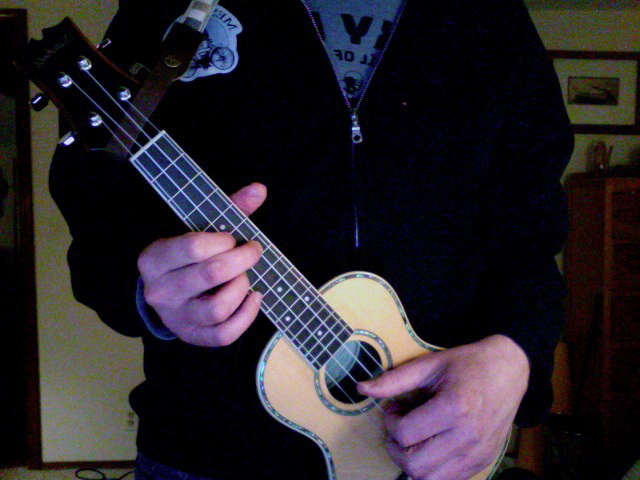 The nice thing about the uke – strings are easier to push down, being nylon, not steel, and there are 4 strings, not 8. I don’t know if you’ll be able to find a ukulele teacher in your town. Ask around if you know uke players – maybe one of them can teach you. Maybe check craigslist. Sometimes community education programs offer beginning ukulele classes. You might want to look into that. There is probably one such class still being offered in the city where I’m from, Modesto, CA, but here in Boise – a uke group for experienced players – but no beginners group or community ed. class. That’s ok, I am learning on my own. Here’s a performance by a community ed. class for beginners in Modesto, CA. I was in the audience, and made the video. It was a fun night. One last thing to consider regarding the ukulele: Some people, maybe most, prefer to play the traditional way, without using a strap. I don’t. I found trying to hold and play the uke at the same time to be too awkward, and had a strap button installed on the back of the instrument. A tech at a music store did this. I’m not exactly great with power tools. I bought a ukulele strap and a strap adapter. A strap adapter is needed to attach the strap to the headstock – a piece of string or shoe lace will work, but I like the look of a leather strap adapter. I bought a strap and strap adapter on etsy.com – great site – the items being sold are made by individuals or small businesses mostly, and you’ll find unique stuff there that you won’t anywhere else. There are factory made ukulele straps, I’m guessing, but I wanted something unique. The woman who made the strap I bought is named Martha Crow. I bought a great guitar strap from her too. Much easier and more fun to play with a strap attached to the uke, I think. Also, some playing styles and techniques aren’t possible when not using a strap. Even Jake Shimabukuro uses a strap, just a different kind. 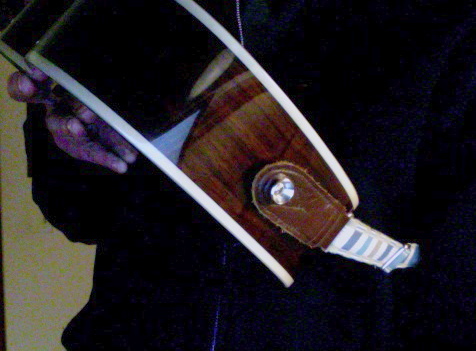 Mine is a guitar-stye strap, just narrower than a guitar strap – only 1″ wide – and works great. Looks like a miniature guitar. You can play it like a guitar, but as I mentioned earlier, it is tuned in A, not E, so a chord, for example, a G chord on the guitar will be a C chord on the guitalele, even though your fingers are in the shape of a G chord. Guitaleles are fun, much more portable than standard-size guitars, and sound nice, but there really isn’t a point in starting out on one of these – if this is your first stringed instrument. If you do buy a guitalele, also called a guilele, I’d say buy a Yamaha.These sell for about $100. I like the one I bought. I purchased it because I could already play guitar a little – not well – but enough to have some fun on the guitalele. However, since I couldn’t play the guitar well, I couldn’t play the guitalele well either, and eventually sold it. Later, I bought a concert-size uke instead. For guitarists.. hey.. you already know how to play the guitalele! Just remember it is in a different key. If jamming with guitar slinging buddies, make sure they use a capo on the 5th fret! These really do sound nice. You are going to have to spend more on a beginner model to get a decent one than you would for a ukulele, as far as I can tell. For example, I like my Mitchell uke ($99.99 new), but do not like the Mitchell basic model mandolin. And the Mitchell mandolin costs at least $50 more than the Mitchell ukes. Best starter model mandolin that I have tried so far is The Loar, but it will likely cost you around $300. This one felt better built than the others I tried, which were made by Mitchell, Epiphone, Fender, Gretsch, and Ibanez. The Gretsch New Yorker G9300 (I think that was the model) was pretty good though. Pretty close in price too. Advantage: Loar. Mandolins come in 2 shapes – A style and F style. The Loar I tried was an F-style. The two styles do sound a tiny bit different from each other. I don’t know enough about these instruments to recommend a style for you. There are some other cheap models, such as those made by Ibanez, Epiphone, or Kentucky, which might be alright to start on, if you want to spend a bit less money than what The Loar costs. As with starter guitars, basses, etc., these instruments will be foreign-made too – from Indonesia or China. Disadvantages of mandolin.. difficulty level.. the neck is very narrow and very curved – narrow like the neck on a uke, but much more curved – making fretting the strings difficult. Some of chords are really tough too. I got frustrated with my mandolin very quickly. It was a decent instrument. A local luthier (stringed instrument builder) made some mandolins from kits and sold them cheap. The problem wasn’t the instrument, I just didn’t like the feel of the neck, combined with the challenge of the chords, so I sold the mandolin. You will need more finger strength to play this than play a uke. The strings are steel, and you’ll have to fret two very close together strings at a time. Also, I’m not aware of anyone who plays the mandolin finger-style – you’ll be playing with a pick. I like playing finger-style, and that is a big reason I am learning uke instead of mandolin. I don’t want to bother with a pick. Ukes can’t be heard very well when jamming with a band though, unless you can plug your uke into an amp and crank that amp up. Mandolins have a far more bright and punchy sound. They go nicely with guitar and other instruments, and can easily be heard without amplification. Mandolin teachers might be hard to find. Check craigslist, or maybe find a cafe in your town where there are open mic nights – a mandolin player might show up. Lots of videos on youtube, and books and DVD’s are available in stores and online. I’ve got a separate post on this one.. and it, like my bass guitar post, is among my most popular. You are vastly limited by having only 3 strings (4 but two are played together) and only a few frets. Yes, there is a surprising amount of songs you CAN play on this instrument, but this is the only one I’m mentioning in this post besides the cigar box guitar that you cannot play music in all keys. For example, there isn’t even a “C” note on the Merlin tuned in open G.
There is a guy on youtube selling Merlin songbooks, but these might be the only ones available for purchase. This is a very easy instrument to learn, and it is hard to play a wrong note. It is fun, but not the most practical instrument to start on, in my opinion. Better to start with guitar, mandolin, or ukulele. You can play in all keys on those instruments, and accompany yourself well when playing alone. Seagull is the name of the brand. Merlins sell for around $130.. sometimes cheaper. I bought a new one from Elderly Instruments online. Sometimes they offer free shipping, sometimes not. I have also seen these in music stores. The key of D Merlin is the more common model. If you don’t know which key one is in, just ask. They are listed by key online. I had one of these for awhile, but felt too limited. I still wanted an instrument that was easier to learn than guitar, and smaller and more portable, but could play songs in all keys, so I bought a uke. I still like the Merlin though. It sounds great. One other thing I should mention.. the neck is quite curved, even worse than the mandolin, and felt quite awkward at first. Before I get to that.. I want mention a type of instrument tuner is best, and that is a little tuner that you can clip on to the headstock (where the tuners are) of your instrument. Snark is the main maker of this type of tuner, but there are others. These and all tuners can be used for all stringed instruments that I’ve mentioned. Prices vary on these tuners.. between $10 and $30. I’m guessing the more expensive ones are more precise. Only problem with these tuners is they can be easily lost, due to their small size. I still haven’t found mine, and am using a larger tuner. Ok then.. which instrument is the right one for you? The vast majority of people who play a stringed instrument start out on guitar. But, if you feel passionate about another instrument, go for that one instead. For example, you might naturally, when you listen to music, pay attention to the bass line, especially if you are listening to funk music, like James Brown or Sly and the Family Stone, or are listening to wild hard rock bands like the Red Hot Chili Peppers, Faith No More (one of my favorites), or Iron Maiden. Maybe you are blown away by Jake Shimabukuro, or love that song “I’m Yours,” by Jason Mraz. (This is going to be the first song I’ll learn). You might want to start out on a uke. If you love Nickel Creek (the main band Chris Thile is in), then mandolin is your thing. or comedian Steve Martin (who is an ace banjo player) or Kermit the Frog (yes, I’m a Muppet fan) – you might be inspired to play the banjo. If you mostly just want to play old-time blues, on an instrument most people have not seen, heard, or heard of, go for a cigar box guitar. If you want something easy that you can play some songs on, and sound great almost instantly, try the Merlin. Whatever floats your boat.. but if you want to play an instrument that you can use to play songs in all keys, is versatile, and accompany yourself, I’d say go for a guitar, mandolin, or a ukulele. ← In the name of love, for Martin Luther King.